Now if it pleases you to smash up bananas to eat with instant oatmeal in the privacy of your own home, smash away. Gobble it up. I don’t care. But let’s just realize that these are not cookies. We have access to a very rich culinary heritage. Let’s not forget what a real cookie is! This recipe is for Apple Strudel. It is brilliant and also dear to me. When Luke and I were first married, we went back to Chicago at Christmas. His mom hauled out this recipe and told me it was time to learn. We stayed up late in their small kitchen with a lot of people talking and helping and milling about. When it finally got out of the oven at about one in the morning, the kitchen was still full of a lot of eager eaters. We cut into it and spat it out right away. Apparently in all the people milling about, Luke’s sister had been cleaning up and dumped a bowl of table salt into the top of the sugar canister. So we had stayed up late into the night making a salted apple roll. But I learned how to do it, even if not what it is supposed to taste like then, and I came home with my photocopy straight out of the Slovenian Church cookbook. The ladies in that book looked like they knew their way around a strudel, as well as everything else. Although that is a great memory for me, it isn’t the only reason I love this recipe. My mother-in-law is Dutch 100%. She got this cookbook and taught herself to make strudel so that she could make it for her father-in-law. He passed away quite young, but not before she had made him strudel. So here I am, also not Slovenian, although I have the name now, making strudel still. Generally we all try to use sugar. Also, I took all these pictures before daylight savings on a rainy winter day. Just the kind of weather that is bad for food photography but wonderful for strudel. You’ll just have to bear with it! It isn’t a hard thing to make at all. It is a tiny bit of a production, but not much. You make the dough and let it sit at least an hour and up to five. In the meantime, you can peel the apples, toast the breadcrumbs, melt the butter, and mix the cinnamon and sugar. Once these things are all ready, it is just the fun part left. With the mixer running, pour in the mixture, and then 1 cup lukewarm water. Let it mix. 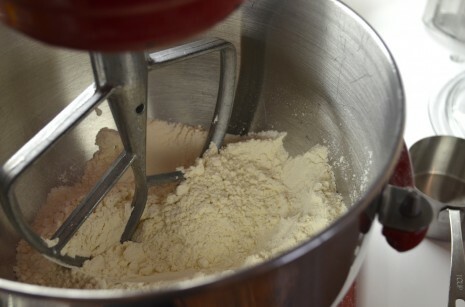 I leave it in the Kitchen Aid for several minutes – because all that kneading brings out the gluten which this recipe depends on. The dough should be smooth and soft – not too sticky to handle, but not dry. Put a little oil in a bowl, knead the dough by hand for just a minute and to shape it into a nice ball, then press it into the oil and flip. Cover with some plastic wrap, and let it rest in a warm place for at least an hour, and up to five. In the meantime, peel 3# baking apples. 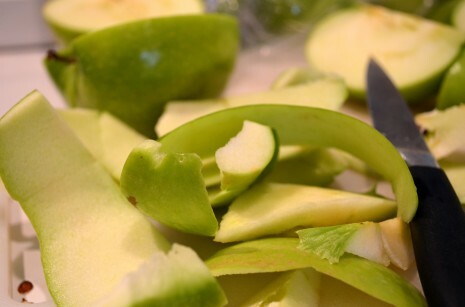 Granny Smith are a reliable choice here, but Jonathans, Jonagolds, Winesap, or any apple that bakes well will work. Mix 1 cup of sugar with one teaspoon of cinnamon in a small bowl and set aside. In a saucepan, brown a cup of fine bread crumbs in 3/4 c. butter. Set aside. Melt another 3/4 c. butter and set aside. Preheat the oven to 450 degrees. Now you put a clean sheet or tablecloth on the table and sprinkle flour on it. Rub it in little. 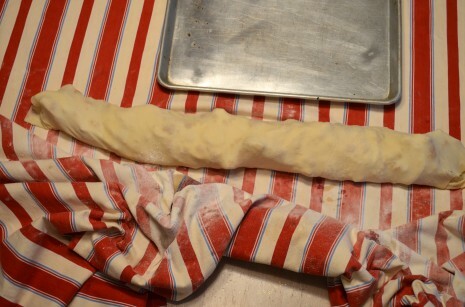 Put your dough in the center, and roll out to a circle about 18″ across. Pour some of the warm melted butter on it, and rub it in with your palms. Now, with your palms, reach under the dough and begin stretching. You want to work from the inside out, walking around the table as you go. Gently stretch and move along. You want the whole thing to cover an area about 3ft x 4ft. Just work quickly without worrying about it. I believe strudel is like pie, in that it can channel anxiety. This is not rocket science. Try to be like the women in the Old Country who just made it without comparing it to the perfect strudel of all time which they have seen on Pinterest. As you stretch, you will be making this dough stinking thin. You should be able to read a newspaper through it when you are done. When it gets to be huge and fairly rectangular, you will want to trim the edges. I use a pizza wheel – just to cut the very edge, which remains thick, off. Now on to assembly. Get your buttered toasted breadcrumbs and sprinkle them all over the dough, except the bottom 4″ (lengthwise). 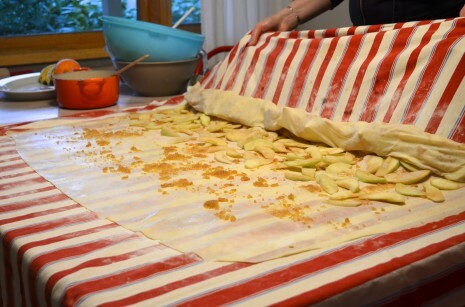 Spread slices of apples on the lower half of dough (also leaving the bottom 4″). Sprinkle the cinnamon sugar over all the apples. 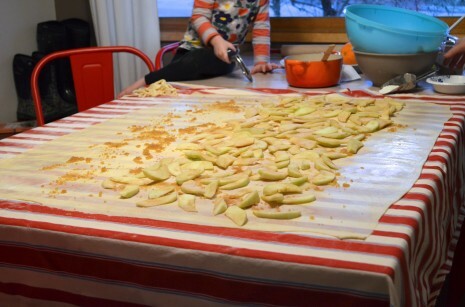 Now fold that bottom 4″ up over the apples. Now pick up the edge of the tablecloth and carefully begin rolling. When you get to the end of the apples, stop. There is still butter! Drizzle all but a couple tablespoons on the remaining bit of pastry. Then roll it all the way up. It is possible that the side edges are supposed to be turned in too. I don’t, and the ends are delicious so I’m not worried about it, but if you like to keep things tidy, you might try that. When it is all rolled up, transfer it to a greased jelly roll pan. As you can see, you will need to shape it in an S to fit it on. Use the last little bit of butter to brush the outside, and then pop it in the oven. Bake at 450 degrees for 20 minutes, then 375 degrees for 20 to 25 more. Cover with a clean tea towel for 10 minutes when it gets out of the oven; then cut in half and transfer with a couple of spatulas to a platter. Dust with confectioners sugar. Yum. This serves quite a few people. I make two when I do it for Sabbath dinner. A lot of people have seconds, some have thirds, and we have leftovers. So I’d say you can safely get 20 slices out of one, and, served with some ice cream, no one has anything to complain about. WOW! I’m assuming this is best served the day it is made. Have you ever made it the day before? Any suggestions for doing that? I have always made it the day we were going to serve it- usually so it will still be warm. That said, it is really good the next day after being in the fridge. It does change the texture a bit. I guess you could just give it a try! This looks so good, and I love the story. Yay! Apple strudel! I’ve only made it with the traditional pastry and technique once, but I can tell you that it’s WAY easier than it looks. No trouble at all. What fun! My Grandmother was Slovenian (Pistotnik) and her sister married a Zibert. Great Aunt Julia made fabulous apple strudel and when I asked for her strudel receipt she sent me her Potica instead. They were fabulous cooks! My Grandmother’s parents immigrated to US when she was young. Her massive pancakes were wonderful. Very thin and large cast iron skillet size. They filled them with fruit preserves and rolled them. Topped with sifted powdered sugar. Fantastic! Suzan- That is funny! The only other recipe I have from that book is the Potica. I guess it was the other thing that my mother in law made for her father in law. If I remember correctly, he liked to eat it with ham and horseradish. I’ll have to make that again too and try it out. Wow, this looks just how Robert Farrar Capon describes in “The Supper of the Lamb”. First of all, that strudel looks so yummy and fun to make! My kids would have a lot of fun helping with the dough-stretching part. Secondly, I’m constantly baffled by what some consider, “the best idea ever”, or better yet, “genius”, on Pinterest. I ran across a pin on there awhile back that said, “Ever want to eat a whole bowl of cookie dough and still stay thin?” (Or something of that nature). The chief ingredients of this “cookie dough”? Mashed garbanzo beans, honey, and carob chips. Um, why? I promptly went and made the kids a batch of the real thing and enjoyed a spoon of the real thing more than I would have enjoyed a whole bowl of garbanzo-mush. Some traditions are best left untampered with. “Try to be like the women in the Old Country who just made it without comparing it to the perfect strudel of all time which they have seen on Pinterest.” I love that. 🙂 This reminds me of Germany. Is Slovenian strudel much different than German strudel, do you think? Wow, my mouth is almost watering! I hail from Tennessee but live in Vienna, and I love apple strudel (not to mention other tasty things lining the bakery shelf and boasting topfen, walnuts, poppy seeds, pumpkin seeds, etc.) 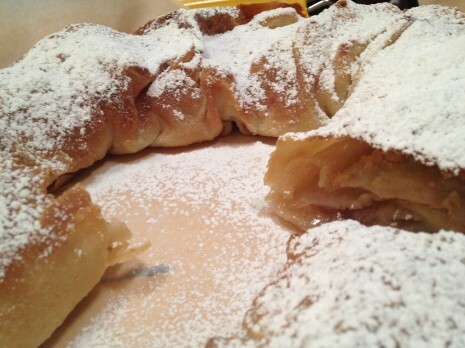 However, next time I think of making apple strudel, I’ll know whose recipe and photos to try to emulate. Thanks for the post. You had me until the clean tablecloth part. Have this in oven right now. Snow has just started falling here in Virginia and with the smell of strudel through the house and flour all over myself and the floor, life couldn’t be any cozier. Thanks so much for taking the time to share this recipe. 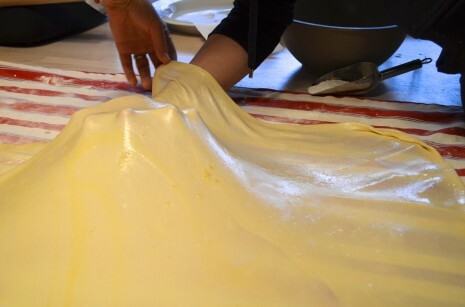 I’m so glad that you demystified strudel and shared how fun it is to make. We have an almost yearly Oktoberfest in our backyard, and a few years ago I figured out how to make strudel from the most authentic recipes I could find via Google. Though it was surprisingly easy, your pictures and instructions would have been even more helpful. Stretching the dough is really an amazing experience, and rolling it up by lifting the sheet is about the most fun I’ve had in the kitchen. It’s also an extremely fun recipe to demonstrate to a group, which I did once for BloomingMoms, our mom’s group here at Clearnote Church Bloomington. If you ever happen to visit Bloomington, I’d love to have a strudel making party!